June 16 through 23. We were holding that week for a group who just recently had to cancel. Too bad! It is a great time to be in Alaska. Many folks up there celebrate on June 21. 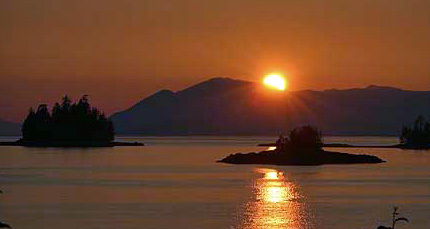 A little googling tells me that on that date in Juneau, sunrise is at 3:51 am and sunset is at 10:09. They call that 18:18 hours of daylight but really it stays light after sunset (I couldn't tell you what happens on either side of 3:51 am...) We have taken photos outside past 11:00 pm. There is plenty of time to paddle that week. Sleeping may be more of a challenge!